Last month I did a combination of two things I almost never do. I bought a whole collection...online! 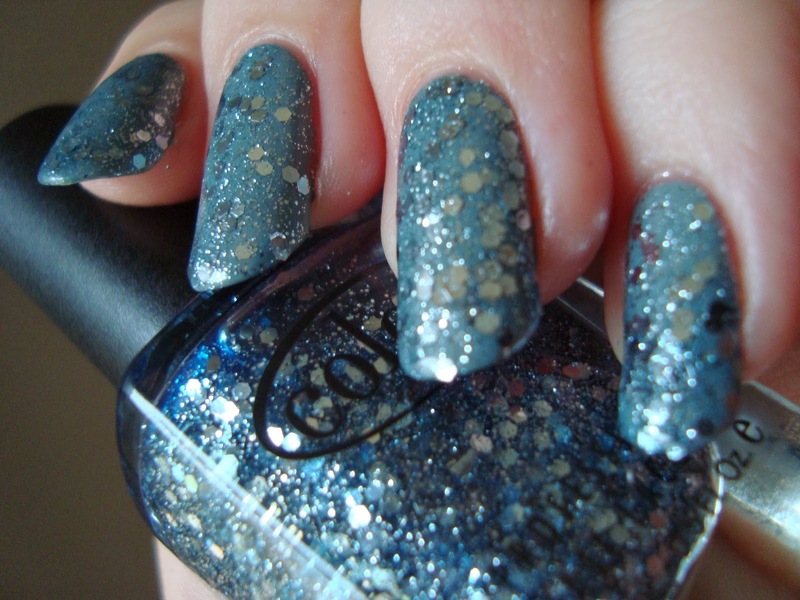 I generally don't like enough from a collection to buy the whole thing and I don't love buying polish online. When I'm in stores I'm always checking swatches and reviews if I don't know much about a polish I like the look of, but there's still something about holding it before you buy it. I hesitated before ordering the whole Harlem Lights collection from Enospring, but I liked the look of Aquaheart's swatch wheel photo from CosmoProf, so I went for it. Based on that wheel, there were four I really liked the look of while another looked ok and the last looked like good undies. $22 seemed like a decent price for four polishes I'd probably love and two that would be at least ok, right? ...right? Apollo Star has a frosty pale gold base with silver holo microglitter. Oh boy. I don't get what's going on here. This is two coats of Apollo Star and a heaping amount of top coat. I wore it to work and had to apply even more top coat before taking these photos the next morning. There's no way around it. This is not good. I'm not sure if it's meant to be textured, but most intentionally textured polishes have little grit beyond just the glitter. All of the bumps here seem to be that tiny glitter. Combined with the frosty metallic base, it just got out of hand. It looked really unpleasant in person, in a way that this photo doesn't quite get across. To see what I mean, brace yourself and click here. The weirdness goes beyond the lumps to the Color Club website itself. They describe Apollo Star as a "shimmering shade of silver". Um....no. Gold! The saddest part of this whole thing is that the pretty little twinkles of the holo glitter are almost completely lost once it's on the nail. Apollo Star actually scared me a little about the rest of this collection. Sugar Rays is a soft gold metallic with a hint of pink. Two coats here too, but still not exactly problem-free. There's more brushstroking than I like. It reminds me of a very toned-down China Glaze Swanky Silk. It's more opaque but nowhere near as shiny or dynamic. The pink is just a touch more obvious in person. It's ok and SFW, but it's a bit ho-hum. Poetic Hues is a soft very pale yellow cream. Another two-coater, and it applied surprisingly well for a white-based cream. Slightly chalky, but decent overall. It does have potential as undies, but it isn't flattering on me on its own. I could see it looking much better on someone tan or darker. Pale colors bring out too much red in my skin, so I had no illusions about how this would look on me. Undies only, but a keeper. At this point in my swatching I felt like I had to give the first two another chance, so I sponged Sugar Rays and an accent of Apollo Star over my Poetic Hues mani. Sponging makes a world of difference for Apollo Star, but doesn't help Sugar Rays as much as I'd hoped. Sugar Rays has a completely different trick up its sleeve. 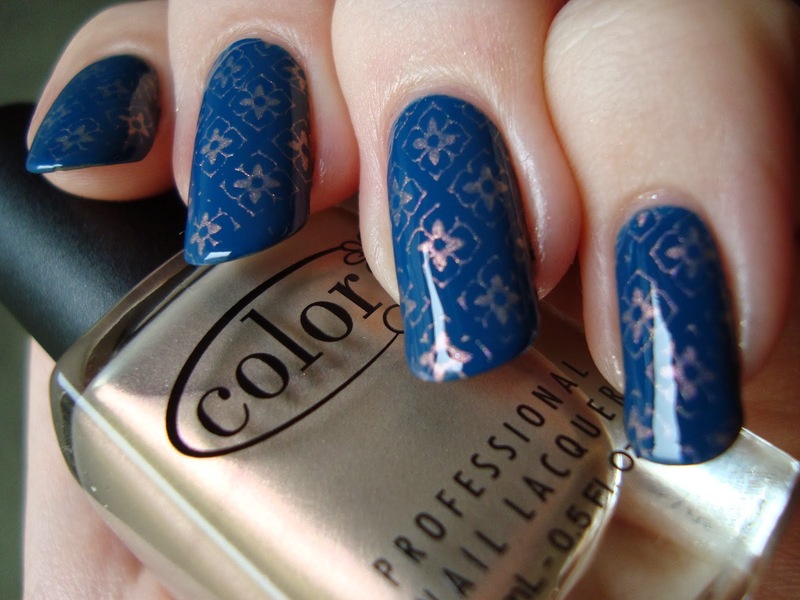 It is phenomenal for stamping! Lady Holiday is a pale warm gray cream. Oh yes! I feel better now. Not only is Lady Holiday beautiful, it's also got a good formula. I used two coats, but one might work because it's fairly thick. The color reminds me of Tom from Tom & Jerry, but I still love it! 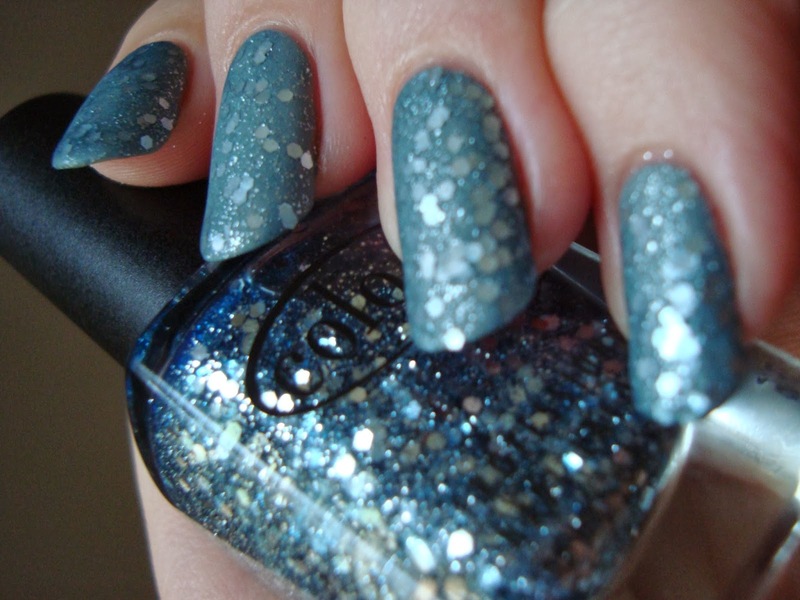 Savoy Nights has medium hexagonal silver glitter and tiny silver microglitter in a very sheer blue base. This one's different in a good way! I can't think of any other silver glitter I own that's quite like this. Most glitters with colored bases either have a vanishing tint or a decidedly jelly base. Savoy Nights is somewhere in the middle. The base is decidedly blue, enough to tint some of the glitter in the first coat slightly. It gives it a snowy sky look over the light gray of Lady Holiday, though it's probably too sheer to wear on its own. The only slightly negative thing I can say about Savoy Nights is that the heavy glitter load and thick base make it a little gloppy. I still didn't have any real trouble with it. I mattified it and the blue tinting stood out even more. Baldwin Blues is a sapphire blue cream. Woohoo, one-coater! I'm a diehard blue cream junkie, so there should be no surprise here, but I'm in love! Baldwin Blues is easily my favorite from this collection and I can't think of anything negative to say about it. I played around a bit more before I was done with this collection, adding a sponged Apollo Star accent to Baldwin Blues. I also stamped over Baldwin Blues with Sugar Rays and MoYou's Artist Collection 04 plate. Bottom line: The creams have this collection's best formulas and I really love both Baldwin Blues and Lady Holiday. Poetic Hues will be good undies. Savoy Nights is unique in my collection and I like how wintery it looks. I was initially kinda horrified by Apollo Star, but sponging it turns it from a lumpy frost to a passable texture. I'm still not sure if it's a keeper. Sugar Rays bored me a bit on its own, turned out to be ideal for stamping. If I do wind up ditching Apollo Star, $22 for the collection was still worth it for the other shades. I wonder what made Color Club choose a Harlem Renaissance theme. I swatched most of these while watching the last few episodes of this season of Boardwalk Empire and found the "connection" a little amusing. None of the scenes were set in Harlem, but Marcus Garvey was mentioned. I also kept getting U2's "Angel Of Harlem" stuck in my head because of Lady Holiday. Can't complain. It's probably my favorite song by them. Always been more of an INXS girl though. I'm a giant U2 fan. High five to you for even referencing them because I thought I was the only one who had that song stuck in their head! I love the blue creme and Sugar Rays. Other than that...meh. But you make them look lovely! Aww, thanks! :) I have mixed feelings about U2, but I love most of Rattle & Hum. Ooh I like Poetic Hues! Although I probably have more than enough similar shades already... Great swatches!